When it comes to PC gaming, consumers have a lot of options nowadays. Long gone are the days where you needed a massive tower for playing premium games -- you can now do so on a laptop. Younger folks may not find that so amazing, but back in the day, owning a notebook was like a death sentence for PC gamers. There are many solid gaming laptops from which to choose, but often, you will find they are limited to 32GB of memory. Why? Well, many DDR4 SoDIMMs max out at 16GB, so when you pair two together, you hit a ceiling of 32GB. Today, Samsung announces that it has started mass production on 10nm-class 32GB DDR4 SoDIMMs. The company explains that "10nm-class" means "a process node between 10 and 19 nanometers." With a focus on gaming laptops, this will make such machines with 64GB of RAM more common. "Compared to Samsung's 16GB SoDIMM based on 20nm-class 8-gigabit (Gb) DDR4, which was introduced in 2014, the new 32GB module doubles the capacity while being 11 percent faster and approximately 39 percent more energy efficient. 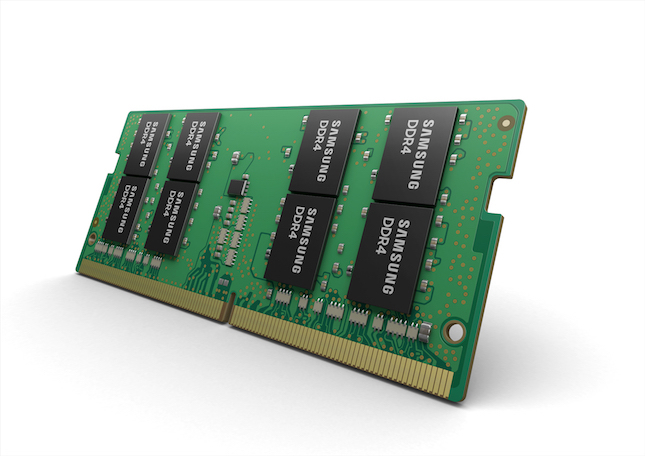 With a total of 16 of Samsung’s newest 16-gigabit (Gb) DDR4 DRAM chips (eight chips each mounted on the front and back), the 32GB SoDIMM allows gaming laptops to reach speeds up to 2,666 megabits-per-second (Mbps)," says Samsung. The popular company further says, "A 64GB laptop configured with two 32GB DDR4 modules consumes less than 4.6 watts (W) in active mode and less than 1.4W when idle. This reduces power usage by approximately 39 percent and over 25 percent, respectively, compared to today's leading gaming-oriented laptops, which are equipped with 16GB modules." Of course, there will be a lag time between mass production and actually seeing such SoDIMMs available in gaming machines or sold individually. With that said, they will likely be quite expensive, so expect to pay a premium when they do become available. Also, while these RAM sticks are intended for gaming machines, non-gamers can benefit from them too.